CHERRY HILLS VILLAGE, CO—Even though his sponsorship deal with Nike expired more than eight years ago, former world No. 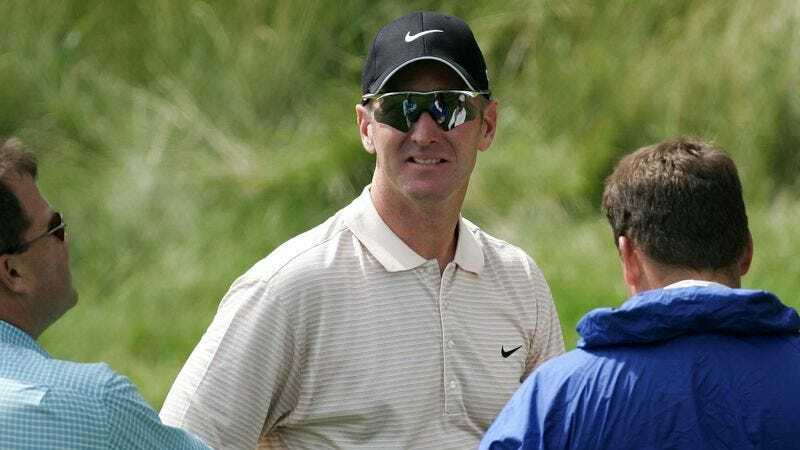 1 golfer David Duval is still appearing on courses and in stores actively promoting the brand's products to anyone who will listen, sources confirmed Thursday. "He's in here about twice a week putting a Nike VR Pro driver in somebody's hands and asking them to take a few swings," said local Sports Authority manager Aaron Camacho, adding that Duval hangs around the store's golf aisles in his full Nike gear for hours at a time. "We've thought about kicking him out, but he's used and read about these products more than any of us on staff, and to tell you the truth, he's purchased more of our Nike stuff than any other customer." Though Nike officials have reportedly thanked Duval for his loyalty and sent him free products in an effort to persuade him to disassociate himself from the company, he continues to be seen in public wearing a threadbare Nike shirt adorned with the brand's patch honoring the victims of 9/11.